After my travels around the Golden Triangle, I had a busy few days doing some strategic planning work for my NGO and then went straight off to Palolem in Goa with La Visitante. And now, I am about to get on a flight to the UK for a eight day whirlwind tour of friends and family, offloading my suitcase of Indian themed presents (tat?) as I go. So I won't be able to get back on top of my beloved blog until I am back after the 9th December - I still have to write up the next few Golden Triangle tour updates! 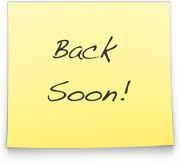 Apologies to my regular readers, I will be back soon, please watch this space! In between trying to finish blogs from my recent travels with La Visitante, I am posting a restaurant review I wrote for the December issue of Chalo Magazine....will be back in full soon! I don’t think I have ever been to a restaurant within a few days of it opening. In London you would have to book weeks in advance to gain access to a new eatery (well one of repute anyway). So it was with some excitement that we were able to reserve a Saturday night table at the hottest new show in town, Serafina. Serafina (3rd Floor, Palladium, Phoenix Mills) is an outpost of the New York Italian restaurant where according to NYMag.com – “it is possible to sit upstairs at the 79th Street location, and pretend you're on a breezy patio in Italy as you munch on delectable thin-crust pizzas, stellar pastas, and inventive salads”. The fact that the Mumbai outpost is based in a shopping mall (even such an upscale one) is therefore maybe a little disappointing. In retrospect , Serafina definitely lacks the authentic New York vibe of say, Café Zoe. And once inside, the interior is as far away from a ‘breezy patio’ in Italy as it is possible to get. It would be better described as a homogenous chain restaurant with little character and little warmth. Never mind, perhaps their pastas would indeed be ‘stellar’. Upon arrival at 8.15pm the place was already starting to fill up. We were seated against a faux frescoed wall - certainly Michelangelo has not been a big artistic influence in these parts. Our waiter introduced himself as Pradeep (or “Pradeepi” as I tried to call him in my best and most hilarious Italian accent). Blank looks all around. That night we were dining out with two Indian friends who are extremely well versed in the Mumbai restaurant scene and I was hoping to impress them by bringing them to Serafina. Firstly my husband chose some wine for us ladies – a nice bottle of Antinori Santa Cristina (Sangiovese). It would have been even nicer if it had been served at the correct temperature bearing in mind the price tag was 3,500 Rs plus tax (and that was at the lower end of the price range!). Still, it was a treat after my usual nightly dose of Sula and it soon warmed up. For starters there was quite a bit of umming and aahing over what to choose. Everything sounded so wonderful. It was the dishes with imported ingredients that immediately jumped to the fore. We chose the “Prosciutto & Bufaline”, the deep fried calamari and the “Tartare di Sofia” – finely chopped ceviche style tuna on a bed of cucumber served with small rounds of finely sliced toasted bread. 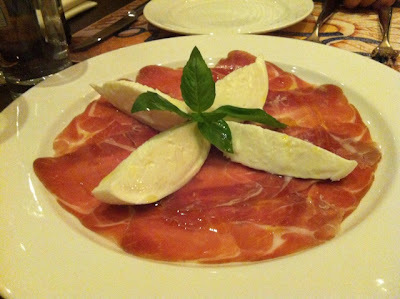 When I sampled the buffalo mozzarella, it was definitely an “Under the Tuscan Sun” moment. Creamy, meltingly soft and 100% bellissimo! Being starved of decent quality European ingredients had taken its toll on me more than I realised. 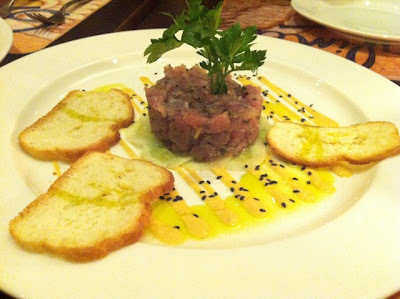 And the tuna was so light, so delicate and so authentic! I loved it. Except I was a little bit annoyed when the waiter snatched the plate from under our noses, when there was still a smattering of the ambrosia on it. I nearly hollered after him (desperate or what!) but then remembered where I was and who I was with. The basket of calamari (how very Beefeater Steakhouse), which was actually enough for two or three people to share, was deemed ‘OK’ by our guests. The many small rings of squid - I would have preferred choice large ones - tasted fresh but the breadcrumbs were slightly lacklustre and not quite crispy enough. I think I would have favoured a light tempura style batter over breadcrumbs, but I am not sure that would have been authentically Italian. Prosciutto & Bufaline - Bellissimo! We had mixed feelings about the main courses. My husband chose the “Farfalle al Limoncino”, whilst I went for the lobster stuffed ravioli in a lobster bisque sauce and our friends chose a “Ravioli al Porcini” and a parma ham “Di Fabio” pizza. I felt that the pastas were all served inappropriately – dished up on to large plates with the sauce splodged around the edges instead of neatly contained in proper pasta bowls. Points definitely deducted for presentation. However, the creamy sauce on my husband’s farfalle was light and subtly lemony (another “Tuscan Sun” moment), and the porcini ravioli was really rather good. The pizza was suitably thin and crusty with a good layering of the salty parma ham on the top. And I am pleased to say that despite my initial reservations about presentation, the pasta was cooked perfectly al-dente and appropriately coated in sauce - instead of the overcooked, swimming-in-watery-liquid dishes that are normally served in Mumbai’s Italian restaurants. Our guests, who were not long back from a holiday in Italy, said that they had almost been transported back there by the food. So that was good. But hang on - I did not mention my lobster ravioli! Oh my gosh, I am sorry to say it was most unimpressive! The pasta was cooked well but I do not believe that a fresh (or indeed frozen) lobster had been anywhere near the filling or sauce. It literally tasted of cardboard but with a hint of some unidentifiable spice. Our Indian guest remarked that it had been ‘Indianised’….well I may disagree with that as it did not blow my head off with chilli and it was also very bland by Indian standards. But something was certainly amiss with it. Disappointed, I left three quarters of the ravioli – thank goodness we were eating with Indians who are more than happy to share their own food! (PS. (Apologies for the lack of photos of the main courses by the way, I got a bit caught up and forgot to take any!). By the time dessert was offered we were quite full but decided we could still squeeze something in (isn’t that always the case?). 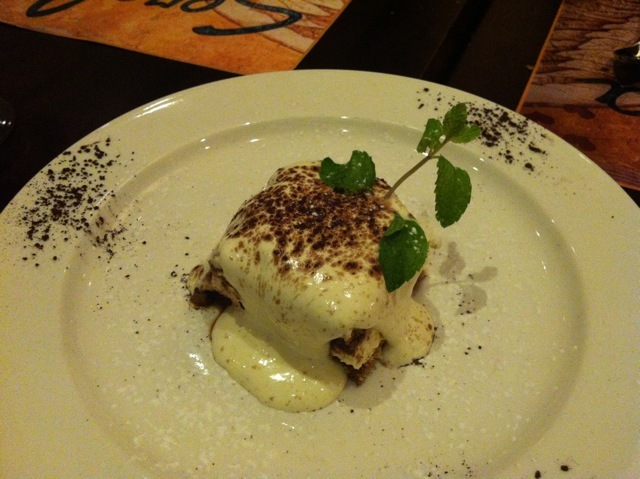 So we went for the supposedly famed tiramisu and four spoons. Well I’ve eaten a lot of tiramisu in my 41 years so consider myself quite an expert. When it arrived, I was slightly disappointed to see that pouring cream had been lathered all over the top. I immediately knew that this would smack of UHT…and I (think I) was right. However the sponge fingers used to make the dessert had been properly soaked in the correct amount of coffee/rum mixture and nicely layered with mascarpone. I wouldn’t say it was the best tiramisu I have had in my life but it wasn’t bad. Next time I will ask for ‘no cream’. We didn’t bother with coffees and asked for the bill. And the bill was probably one of the most expensive ones we had ever paid for in our short time in Mumbai. Four starters, four mains (all with a good amount of imported ingredients), one dessert, a bottle of the aforementioned read wine, three Kingfishers and two imported ‘Birra Morrettis’ came in at a rather scary 14,800 Rs including service charge and taxes. Granted – 50% of the bill came down to alcohol consumption. If there is two of you going for lunch and you stick to sharing one calamari and a couple of simple pasta dishes and a bottle of water, it would be possible to eat for under 2,500 Rs including service and taxes for the two of you. 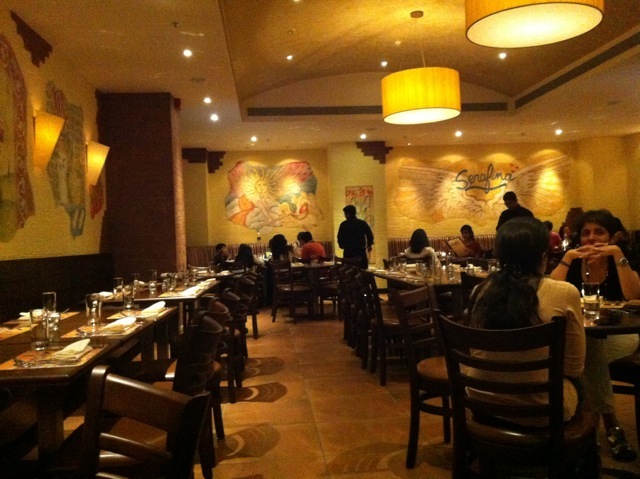 The service was very good (especially our waiter ‘Pradeepi’) – we didn’t have the usual five or six staff hovering intrusively around our table and neither did we have to chase for attention. By the time we left at 10.30 it was really quite buzzing with friends and families dining out in groups – I did not see many children. As we walked out, our Indian guests excitedly remarked that Shobhaa De had been sat on the next table to us the whole time we were there. Unfortunately I wouldn’t have known who she was to recognise her! But such is the pull of a new upmarket restaurant in Mumbai. 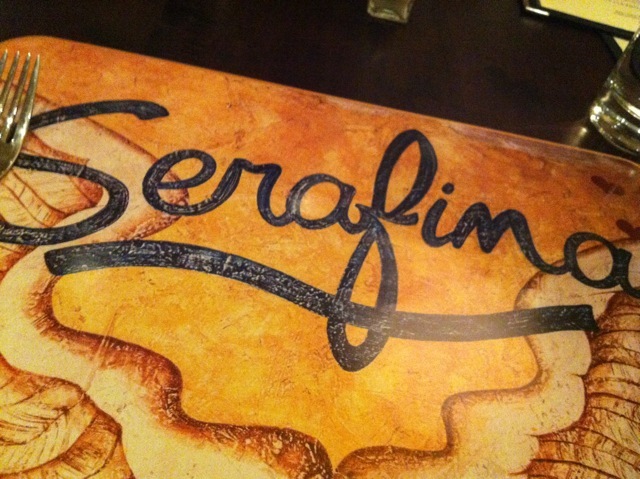 All in all the Serafina dining experience was nice but not spectacular considering the price. For that kind of money in Mumbai, you should be expecting plusher (or at least ‘trendier’) surroundings and top notch service. However, if you are lacking vital nutrients in your diet (I speak of European ingredients!) I recommend going just for the buffalo mozzarella, prosciutto and tuna tartare. All divine! After not having a wink of sleep on the overnight train from Agra, we were thankfully picked up by a taxi at the train station and brought back to our hotel, the Ramada JHV Varanasi. This accommodation was rather a cop out on my part - when I was sorting out our Golden Triangle Tour, all the smaller hotels had been booked up due to it being Diwali - and rather than book a 'dive', I decided to go for 5 Star, characterless and corporate hotel (with very annoying 'Musak' constantly played in the restaurant and lift!). I don't think La Visitante was too impressed by my choice! Anyway that aside, it was actually nice to sink into a comfy bed with squidgy pillows after the previous evening's experience, for a quick morning nap. Later on, and having no energy whatsoever to fend off rip-off tour guides and rickshaw drivers, we decided to use the hotel's in-house travel service to reserve spots on the evening and early morning boat tours on the very sacred Ganges. We paid over the odds, but were past caring by this point. The sunset boat ride on the ghats is all about the Aarti ceremony on Dashashwamedh Ghat. This is a kind of puja, where candles are lit and offered to deities, songs are sung and bells are rung. The one we witnessed (which occurs nightly in Varanasi) goes on for a very long time. A very long time. Aarti ceremony on the banks of the river Ganges. The men sitting down are ringing the bells (monotone) and the specially trained guys standing up are waving around very heavy candle stands. All in time with each other. It's quite a spectacle. But firstly the boatman and our guide (a crazy crazy guy who I am sure was high on something) took us for a slow row up the Ganges. From the river, everything is on view as you work your way along. Life and Death. Our guide tells us that people who have done bad things in their lives, can come to Varanasi and basically pay to have their souls cleansed. What a cheat I think to myself. We see some old men swathed in orange cloth sitting on the steps on one of the Ghats and our guide tells us that these men smoke hash all day - but they are allowed to because they are "Holy Men" (Yogis I guess). Maybe our boat guide is also a 'Holy Man'? People pay these men for holy consultations in the belief that they will be relieved of all their wrong doings. To me they look like hobos - just because they have long white beards, smoke hash and wear orange cloth, doesn't make them holy. What a con. There are people bathing in the waters and throwing the Ganges over themselves. I am trying not to think about hepatitis. The banks are filled with rubbish - and everyone knows where Varanasi raw sewage ends up. The guide asks us to light our little candles, say a prayer to the setting sun then let the candles float off on the water. Then he tells us to scoop up some water to press to our hearts and foreheads. Oh my god ...no way! I make a pretence at this but he sees that my hands are dry and tells me to go again. I do actually make a prayer at this point, but not for the purpose that he thinks! Our rower - a little old man chewing paan like there is no tomorrow rows us back to Harishchandra Ghat and as we approach, the orange wisps of flames grow bigger. I know what is coming up for Harishchandra Ghat is where Hindus burn their dead. In some cases the bodies are carried from miles and miles away. In other cases, people come to Varanasi in order to die so that their ashes can be immediately thrown into the Ganges. I am not sure how I am feeling about witnessing 'live' cremations (plural as there are about five or six happening at any one time). La Visitante and I both later agreed that it seemed pretty disrespectful for boat loads of tourists to be sitting on the river witnessing this, 'just for the experience'. There is even a boat load of Thai tourists who are standing up and taking photos of the spectacle! This makes me sick to the stomach. Then an even more dreaded moment occurs. The boatman turns around to us and remarks what nice pashminas we are wearing (to protect us against the early evening chill of the river). Oh no, I so know what is going to happen next! "My wife, she is a fashion designer, she sells wery, wery nice scarves"...."Oh really?" we say, trying to look disinterested. Even in Varanasi, so concerned with life, death and do-gooding, you can not escape the pashmina salesman! We are being tempted with more scarves right here on the water!!! So after getting off the boat at the end of our tour (after the long Aarti ceremony), we are walked back to where the car is parked via his PINK house. In the PINK house, we are asked to sit down in a room where the walls are stacked to the rafters with silk items. Scarves, bedcovers, sarees - the usual stuff (all that is missing is the silk weaving demonstration). We try to object, saying we are too tired after not sleeping the previous night. But we are made to sit down and have a cup of chai. Then we are shown a photo album (deja vu?) with pictures of the day when GOLDIE HAWN visited his PINK house to buy sarees and silk scarves. If it is good enough for GOLDIE HAWN, surely it is good enough for two British ladies? To be honest we couldn't give a stuff and despite virtually the whole of his family showing up (including his very overweight and scantily clad brother! ), we did manage to eventually walk out - but only on the premise that we would return after the sunrise boat ride the next day. When we first met the boat guide's brother, he was only wearing a towel! This blog will be far too long if I describe the sunrise boat ride in full. It was pretty similar to the previous evening's jaunt (and with the same boatman and high-on-life guide) but with the difference that the Ganges is bathed in an eerie early morning light as hundreds of people gather on the Ghats to wash themselves in the murky water. Bodies were also still being cremated at this time in the morning - around 6am. There is heavy traffic as La Visitante and I together with hundreds of other tourists are rowed up and down the river banks - it's pretty much like a day out at the Cowes Regatta. Even more so as La Visitante rolled up her sleeves to take over from the boatman...and rowed several hundred metres up the Sacred Ganges! Most impressive! On the way back from the sunrise tour, we managed to dodge the PINK house by walking very quickly with our heads down. I think the guide got the message and did not press us to enter his house. Already at 7am the streets were full - the city teeming with maimed humans and maimed dogs. We couldn't wait to get out (Varanasi Very Nasty La Visitante called it). 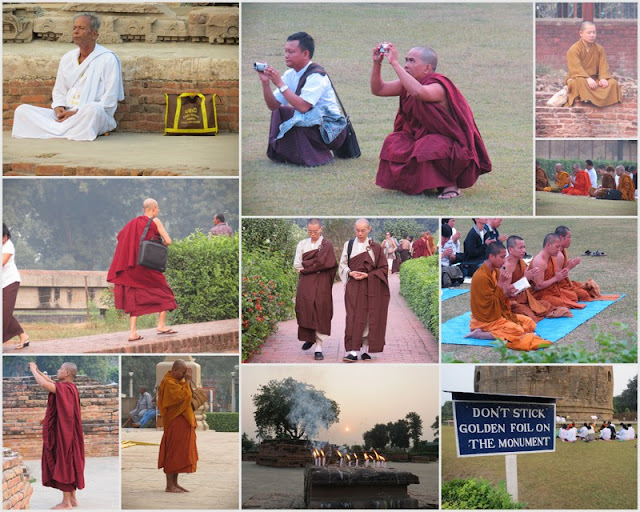 Later that day, we visit Sarnath, a lovely and relatively peaceful (and very sacred) Buddhist temple site with a huge stupa. We see Buddhist monks wearing an array of colourful robes, taking photos on their mobile phones and carrying laptop bags - yet another weird scenario. At Sarnath, Buddhists everywhere in their colourful robes- some clicking away on their mobile phone cameras, one carrying a laptop bag. Modern spirituality. That was it for Varanasi. And the end of our Golden Triangle Tour! The next day we flew back to Mumbai. Thanks for keeping up with the saga! School chidren in a cycle-rickshaw on the way to school. After being virtually forced into buying the rug, we made it to Fatehpur Sikri en-route to Agra. Built during the second half of the 16th century by the Emperor Akbar, Fatehpur Sikri (the City of Victory) is a World Heritage Site. "It was the capital of the Mughal Empire for only some 10 years. The complex of monuments and temples, all in a uniform architectural style, includes one of the largest mosques in India, the Jama Masjid". By this point we already thinking "Another City, Another Mosque". They all seem to merge into each other after a while..perhaps we are just cultural no hopers. After watching a strange lady making yoga shapes in one of the archways, we decided it was time to get away, and drove on the 1.5 hours or so to Agra. I won't go into great detail about Agra except to say that we visited the Taj Mahal first thing in the morning when there was still a queue at the expected sunrise time of 6.00am. But it was so worth getting there that early as the mausoleum was definitely more beautiful and far less crowded at that time in the morning. We found ourselves a crazy little old man of a tour guide who told us very little about the building, but was an ace at pushing other tourists off the prime photography posing sites - ie the Lady Di bench. With him in tow, La Visitante and I were able get great photos separately and together - I was only sorry I hadn't found him when I previously visited the Taj Mahal with my husband. Later that day we decided to start getting ready for the rather dreaded 12 hour rail journey between Agra Fort and Varanasi. Unfortunately, although I had booked the tickets well in advance (second class air conditioned or "2 AC"), we had only been 'Waitlisted". This meant that the train was fully booked and that we were on a waiting list. We were at positions 6 and 7. You can book train tickets from 60 days before the travel date but what happens is that travel agents get ahead by booking up as many tickets as they can in the hope of selling them on to the public themselves. You've therefore gotta be quick if you are going to use the on-line train booking system (I used MakeMyTrip.com where you can now book Indian National Railway tickets) rather than go and buy Tourist Quota tickets at selected stations which is what I should have done. You can check your waitlisted status online to see if any one drops out. On the day of travel at 9am we were still at positions 6 and 7. By midday we were at 3 and 4 which was a little but still useless progress. Our train journey was at 9.30pm so I was getting very nervous by this point. At 3pm La Visitante and I took ourselves off to Agra Fort train station to see if anything could be done. We hounded the man behind the glass partition for about an hour. But it seemed that no improvement to our situation could be made there and then. He told us to buy a 'general ticket' but I was not sure what this meant. Then he said come back at 5pm to see if any passengers had not shown up for the train as it had progressed from its starting point in Jodhpur. There was no way we could not get on this train as it would mess up our schedule - we were flying back to Mumbai from Varanasi and if we missed this train, we would more than likely end up missing that flight. When we went back at 5pm. we found the same guy and he told us we had moved up to positions 1 and 2. Relief!! Surely this would mean that we would get on...surely someone else would not show up for the train and we would be safe! I should have touched wood. At 5.30 the railway clerk checked again ...this would be the last stop before Agra and the last chance for a vacancy in our carriage. But alas! We dropped off the manifesto altogether...there were to be no spare seats by the time the train got to Agra! I was in a real panic now but the clerk said don't worry, go and find THE MAN IN THE BLACK HOOD when the train comes in and he will help you. Wow, I would go and see the grim reaper, this did not bode well. Our third and final visit to the station was an hour before the train was due in. The platform was absolutely chokka with locals and tourists alike. I forgot to mention that it was also the peak of Diwali that night - so there were more people than usual, trying to get home to their families over the period of celebration. I could see where this was leading. I checked the lists that were posted up on the wall and I definitely could not see our names there. So I went hunting for THE MAN IN THE BLACK HOOD. I walked up and down the platform about four times with no luck. The platform is about a mile long. No joke. Then a policeman wielding a big stick pointed out THE MAN IN THE BLACK HOOD to me (being actually a man in a black cap...not half as sinister). I went running up to him to see if he could help me but he said come back later when the train arrived on the platform. I was too early to hassle him. It was 9.25 and we were feeling extremely frantic. I had left La Visitante guarding our not insubstantial luggage (all the shopping from Jaipur) and local people were coming up to her and just staring....poor thing. In the mean time, I had not been able to track down the same MAN IN THE BLACK HOOD but instead another MAN IN A BLACK JACKET. This guy was not helpful and kept trying to brush me off. As the train, our train came into the station, he started walking up to the front end with me running after him, trying to communicate and ask him how we could get on to this train (I was trying to ask him in an indirect manner if it was possible to bribe him!) All I got was short shrift and told to head down the Sleeper Carriage. The sleeper carriage is basically the bottom of the pile when it comes to train accommodation in India. Nevertheless, La Visitante and I ran down to the other end, dragging our suitcases/Jaipur shopping, passing each sleeper carriage and trying to see if there was a free spot. There was not. All there was, were millions of bodies, with faces peering out of barred, glassless windows at us. So we ran all the way back up the platform (again!) where the MAN IN THE BLACK JACKET was fiddling around with his paperwork. I started pleading with him - "please let us on please let us on, how much how much?". Angrily he shrugged us off again and shouted at us that we would travel in the General Carriage. Agh! I knew that we definitely had a ticket for the General Carriage as we'd been told to buy one by the Railway Clerk. So once again, La Visitante and I picked up our suitcases and ran all the way to the other end of the train. Like I said before the train is about a mile long. No Joke. And I am very unfit. So we reached the General Carriage with about three minutes to spare before the train is due to pull out of the station. You know I said that the Sleeper Carriage is the bottom of the pile when it comes to train accommodation...well I was wrong! The General Carriage has only bench seats and they allow as many people that can cram on to, well...cram on. The door was blocked with standing men, women and children and I could already see that people were already sitting on top of each other in the carriage. Undiscouraged, La Visitante tried to clamber on top of the bodies so that I could pass up the suitcases. But it was impossible. And besides which I refused. I was distraught but I could not travel for 12 hours overnight like this. I refused to go any further or make any attempt to join this unwieldy bunch of humans, goats and chickens. In one last ditch attempt I shouted to La Visitante to start running back to the AC compartments. I just had a feeling that we should try something. I was in a terrible sweat at this point but we ran back again up the length of the train. I spotted a gap in the doorway of one of the carriages and shouted to jump on. I went first whilst my friend passed up the cases. But then we turned around and who should appear in the doorway but THE MAN IN THE BLACK JACKET. He gestured to us to get off the train. He had a really scary look on his face. An Indian passenger appeared next to him. I was so exhausted I could not move. He gestured again and this time three armed guards appeared behind him!! Oh my god, we are going be thrown in jail for boarding a train without proper tickets!! Then, on cue, I burst into tears. I start wailing..."please please let us stay on the train...we have to get to Varanasi!". The Indian gentleman talks quietly to the guard. Then I realise that we are doomed and start to try and drag our bags back off the train. But then he puts his hand up as if to stop me in my tracks! The Indian gentleman speaks to him again and then turns around to address us. "Dont' worry, don't cry, he is going to help you...". We could only conclude that the MAN IN THE BLACK JACKET was a sexist, conniving B*****D.
After 12 hours of not sleeping on a bunk suspended from the ceiling from what looked like a piece of spaghetti, we arrived safely in Varanasi. But with the opinion that we would never travel by long distance train in India again! it will put you off train travel forever! BombayJules makes her first appearance on the blog! When our driver stopped the car at a rugseller's shop on the dusty road between Jaipur and Agra, I immediately began to get that sinking feeling. Having already fought off various pashmina and rug vendors in the last few days of our trip, I was really not in the mood for what was coming up. Your driver/rickshaw driver stops the vehicle and tells you that this is the best place to buy a rug in Jaipur "45% cheaper prices than anywhere else...wery, wery good!" Because you have kind of developed a nice relationship with whoever is driving you, you kind of feel you don't want to let him down by refusing just a glance at the carpets - so you agree to get out of the vehicle "just to have a look". A young man sits down at a loom inside the open-fronted shop and proceeds to shows you and your friend/spouse/partner the process of weaving a carpet. He tells you some background information about the local rural village where a co-operative is government funded to buy materials and looms to make the rugs. He then tells you about his very old grandmother who still weaves to this day and his grandfather who works in the fields to help support the family. A proper heartwarming story. Not only are his grandparents also heavily involved in making these carpets, but so are his mother, father, brothers and sisters. This is an amazing and ancient skill that has been passed down through the generations to this young man in front of you. He shows you a carefully prepared photo album of the villager rugweavers. To you, they all look like Bollywood actors. Out of the corner of your eye, you notice a pair of aviator sunglasses hanging up on a mirror on a side wall. Then you glance at the young man, and you see that he has perfectly slicked backed hair and city-slicker style trousers and shirt. Not very rural looking you think to yourself. Then the moment you have been dreading (and when your friend/spouse/partner goes to hide) - when the boy starts flicking out each and every one of the rugs that are contained within the not unreasonably sized room. With each and every unfurling, comes an increasing pressure to appreciate the handiwork, to size up, to measure, to consider colours. To get your wallet out. Before you know it you are talking money...having settled on a nice teal and cream number that will match ever so nicely with your new bedspread, recently purchased at Good Earth. The driver, who has been so quiet yet fixated on the proceedings, starts to hover just a little too near for comfort - within earshot, listening in to all the negotiations. He must think you were born yesterday! An attempt to sell me a more expensive rug that has been worked on for months by his ancient father. But in fact and probably thankfully for you, you 'only' have 10,000 rupees in your wallet so there is no way you are going to buy anything more expensive than that. You are desperate to get out of the shop by this point but because you have a sense of guilt (the poor man is going to have to refold all those carpets! ), you hurriedly agree a price for the teal rug that is way over what it is worth. With smiles all around, the curtains are drawn, you are sat down, the boy's father appears out of nowhere and you and your cohort are offered a cup of chai whilst the driver mysteriously disappears. Then there is prolonged joviality whilst you are made to sign a visitor's book and discuss where you are from. (I can't be bothered to tell them that I live in Mumbai, especially after my shameful attempt at haggling). The driver returns looking pretty happy...after just being paid his cash-in-hand commission. You really should have known better eh??!!! The father of the thief who stole my money and then waved goodbye to me. I wonder whether he is also wearing Bryl Cream under that turban? But on the plus side the rug does look lovely in our bedroom! OK, its a bit creased...and slightly off colour, but I like it! Jaipur was a city where La Visitante and I decided not to do too much sight-seeing. We were there primarily to SHOP! Well it's Christmas soon right? And I was sure that all of the folks back home would want a little piece of India for themselves. Upon arrival in the early evening, the whole of Jaipur's Old City was lit up for Diwali. Boy this must be one wealthy city to afford all those light bulbs and all that energy - I'd never seen anything like it (although I suppose Blackpool Illuminations does come close). On every corner stood large groups of policemen, wielding long sticks and looking like they were expecting trouble at any moment. We asked the driver to take us straight to our hotel - on over embellished Indian folly known as Umaid Bhawan. Actually, this was the cheapest hotel on the trip at about £26 per night for the two of us but I thought the standard was not bad for this price. After inspecting the room and dropping our bags off, we went straight back into town in the hope of getting something decent to eat. We chose Handi's - another Lonely Planet recommendation - a cavernous canteen style eatery with a minimal amount of character. Again, the place was full of Golden Triangle tourists, with few locals. Unfortunately the food matched the interior, being rather lack lustre. After dinner, we had rather a scary adventure involving a tuk tuk that took us along some dubious and poorly lit back streets to a pashmina emporium that we did not want to visit. (Apparently "please go to the Pink City" means "I want to buy a new scarf" in Hindi, did you know that?) After an altercation with the shop owner when we refused to get down off the tuk tuk, we managed to get the driver to take us back to the hotel. This would be one of many times that we would get conned by tuk tuk drivers on the Golden Triangle - no matter how much experience you have of living in India, I think anyone with white skin will share the same fate. Perhaps La Visitante is right...I need to learn Hindi (don't watch this space). The next morning and before commencing our shopping escapade, we did a snippet of sightseeing by visiting Jantar Mantar - an observatory built by Maharaja Jai Singh and completed in 1728. This was a remarkable place, containing huge masonry and metal instruments including giant sundials to calculate local time, zodiac instruments (I never knew Indians were into horoscopes!) and other more complicated instruments to calculate the 'azimuth of celestial bodies'. For the first time on our trip we hired a guide to show us around as the instruments quite clearly required in depth explanation! Then, having completed our cultural exercise for the day, we headed off for the shops (hoorah!). The guide teaching us how to tell the time on this giant sundial. The Old City of Jaipur is pretty much built on a grid system (like New York but not!) and is therefore relatively well planned and easy to navigate. We walked the length of Johari Bazar - the centre of jewellery and gems sales (I came away with a beautiful £12 amethyst) - and then turned on to Bapu Bazar and Nehi Bazar, a long street supposedly famed for its textiles. Here we found mostly tourist tat (or stuff for people who don't know how to shop). Turning right again on to Kishan Pol Bazar (making the third side of a rectangle) I was expecting to see Jaipur's famous blue pottery and ironwork. I saw none whatsoever and started to question our guide book. A selection of semi precious stones in the trustworthy shop where I bought my £12 two carat amethyst. So far we had been pretty unsuccessful in our hunt for quality textiles and had bought nothing between us that morning. Disgusted, we headed off to lunch, to Niros - just outside of the city walls on Mirza Ismail (MI) Road. Guess what...another Lonely Planet recommendation and yet another disappointing experience (you would have thought we'd learnt our lesson by now?) From our experience, Niros served entirely forgettable and bland Indian food to only white faces. And not Italian as the name may have suggested! After a disappointing morning's shopping and a mouthful of bland food, we came away from Niro's feeling rather dejected. However, as it turns out it, heading in that direction for lunch had been fortuitous decision - as it was on Mirza Ismail Road where we ended up finding some great shopping. First of all Himalaya - which La Visitante had been keen to track down for its organic and natural beauty products - where we made some vital face and hair cleansing products, and then a bit further along, I found an old man's shoe shop which so happened to be selling beautiful, hand embroidered Mojari slippers. I bought a pair for myself (of course!) and a pair for a friend back home. Next door to this, we found a fabulous bangle shop stacked from head to toe with a rainbow of 'arm candy'. We spent probably an hour sat on low stools going through all the boxes and making our (rather garish) selections. Feeling a little better after an hour's retail therapy, we took a tuk tuk back into the Old City in the hope of finally tracking down some decent cloth, preferably of the block-printed variety that Jaipur is so famous for (god knows what we thought we were going to do with it once we got it!). We hunted high and low and it was only when a creepy guy started following us (he probably wanted to sell us a pashmina) that we ducked into a saree shop to escape him. Again, another fortuitous decision because after being led upstairs, we discovered that the shop retailed the most beautiful selection of hand embroidered dupattas, silk sarees, pashminas (which we didn't want, obviously) and cloth. After a length period of umming and aaahing, we both selected a hand embroidered dupatta and some silk fabric for another friend back home. By the time we went back out on to the street, the creepy guy had gone. Phew. Gorgeous silk fabrics in the saree shop. As dusk approached, there were still a few items on the shopping list that we had not been able to uncover such as the aforementioned Jaipur blue pottery and cotton fabric. We were about to go back to the hotel when out of the very corner of my eye, I spotted a stack of block printed cloth through a glass door. Excited, I dragged La Visitante into the shop to see if we could not fill up some of the gaps in our shopping bags. Success! This place turned out to be the best quality fabric retailer we had come across - the shop owner later told us that in fact, he supplies to FabIndia amongst others. Our fabrics being measured out. We found beautiful medium weight plain cottons and bought three lots of each for 120 to 180 Rs per metre (average £2 pm) - enough to have several dresses made (watch this space!) - and with our last purchases made, returned highly sated back to the Umaid Bhawan hotel. Hawa Mahal "Palace of the Winds" - built so that the Maharaja's ladeeez could all get a good view of the street below during processions etc....without being seen. After a long and boring car drive along the dusty and not particularly scenic road between Delhi and Jaipur, we stopped off in Amber (pronounced “Amer”) to have a look at the fort but primarily to have a look around the aforementioned Anokhi Museum of Hand Printing. I have a few readers who are especially keen on my textiles and shopping posts so I thought that the place deserved a separate blog entry. Anokhi is famous for, and is a keen promoter of the traditional art of hand block printing on fabric. There is a long history of this type of printing in this area (Sanganer) and Anokhi keeps the tradition alive. The Museum is "dedicated to the collection, preservation and interpretation of block printed cloth". Anokhi fabrics are all fashioned into beautiful collections of fashion and household textiles, mostly with a contemporary edge. I have several pieces of Anokhi clothing and have bought gorgeous table cloths and bedspreads for friends and family from the Anokhi branch in Mumbai. Housed in a beautiful haveli in a hard to find backstreet (thankfully our driver knew exactly where it was as apparently we were not the first textile crazy housewives he had taken to the museum! ), the first thing we did was use the loo. Well it had been a long drive. Then after paying the small entry fee of 60 Rs each, we were able to have a casual look around – as we seemed to be the only ones there. Yaaay, finally no coach loads of foreign tourists! Of course what we really wanted to do was check out the on-site shop and see if they had any heavily discounted bargains. Unfortunately this was not to be as in fact they had a smaller selection of clothing than in their regular shops and hardly any household textiles for sale. What they did have however, were some lovely bags of patchwork squares cut from excess fabric which I had not seen in any other branch of Anokhi. So some shopping was achieved! After that moment of excitement (but slight disappointment about such a small shop), we were able to settle into having a look around the museum. There was something to see on each of the three floors, with each area connected by windy steps (fun for kids). There were glass cases containing various fashion collections from over the years, displays of block printing equipment and fabrics with showcasing the many methods of printing. On one of the open squares of the building, we came upon a little old man who was creating a new block out of wood – chiselling and hammering with such precision using only a hand drawn design as his template. The original paper template which had been drawn by hand. A range of hand drawn designs and finished blocks. On another floor a demonstration of the block printing art was also being shown. 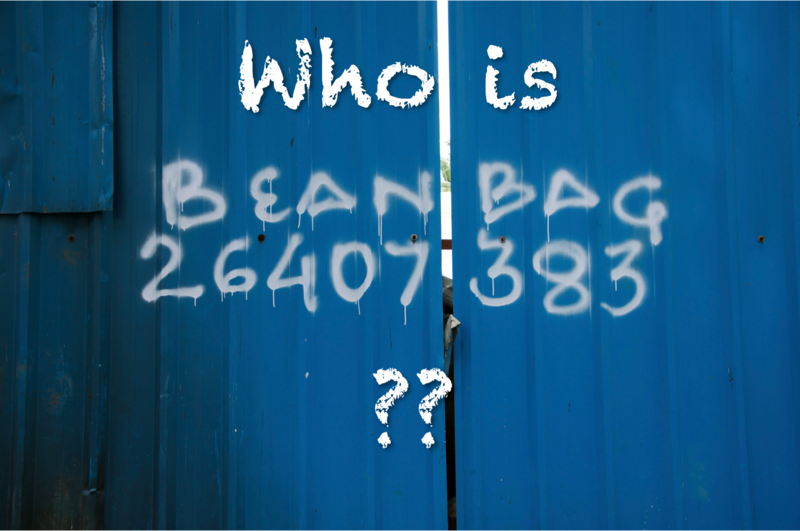 A wiry man was pressing a block into some plain white fabric and then slamming the side of his hand down on it to leave a decent impression. I wondered to myself if he must suffer from sort of repetitive strain injury from doing that all these years. Most of us would be left with severe bruising from carrying out that activity for just two minutes! 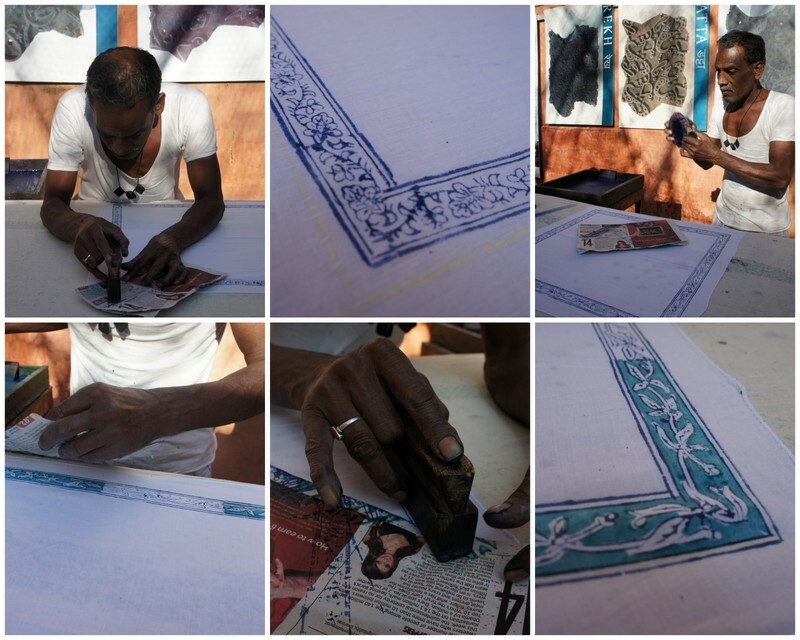 The precision of the block printing was very impressive – everything being done by eye alone – and very interesting to see. The art of block printing being demonstrated at the Anokhi Musuem. A second block of green dye being overlaid over the original template outlined in blue. The precision of doing this by hand is astounding. Make sure you carefully check the website above for opening and closing times before visiting. That was the end of our little excursion to the museum – after that we went on to the very scenic Amber Fort - where we were chased through the many corridors by teenage boys trying to sneak photos of the fair skinned La Visitante.